Li Wenzhong -also nicknamed Shiben- was born 1339 in Xuyi village in today's Jiangsu Province. He was the son of a sister to Zhu Yuanzhang, the founder and first emperor of the Ming dynasty. Li Wenzhong became a general already at the young age of 19, supporting his uncle's quest first to gain supremacy of the Yangtze area and then to oust the Mongolian Yuan dynasty rulers. Li Wenzhong distinguished himself in many battles and was soon conferred the honorable title of "Caogougong", third in the temple line of merits. Below that of his fellow Ming general, Xu Da. He bravely led the frontal cavalry attack on 12 March 1365, which finally destroyed the main Wu state army and –with that- later that year the entire Wu state. Li was also in charge of one of the two main Ming armies which in 1370-71 pursued the remnants of the former Yuan troops deep into Inner and Outer Mongolia inflicting heavy losses on the enemy. Li Wenzhong was fond of Confucianism and subscribed to the core idealistic parts of the philosophy. Zhu Yuanzhang practiced a military elite independent of the civil service. This was similar to that of the current Yuan regime but deviated from the traditional Chinese dynastic system where officials held both civil and military posts. The number of generals was kept rather low. They were at first picked from Zhu’s family and then from childhood friends and comrades in arms. Eventually, all generals were family members. Generals in turn recruited their direct subordinates after the same principle and so forth as the army grew. Soldiers enlisted to fight with their leader and looked to him for protection. This differs completely from today’s armies which links are based on institutional authority rather than personal loyalty. It followed from this system that the leading positions tended to become hereditary. When a leader died his son or brother would assume the leadership. No one from outside would be acceptable. He was one of the few learned relatives of Emperor Zhu Yuanzhang. The Emperor acknowledged the value of Li's academic skills by for instance appointing him to head the National University in 1383. The Emperor perceived an increasingly poor discipline and growing lax attitude among his higher ranking followers in the early 1380s. Hence Li's dual serving as head of the prestigious university along with top military commissioner was the medicine Zhu Yuanzhang saw as proper to reinstate complete loyalty. Li never hesitated to put forward appeals to Emperor Zhu, which in itself had been fine had he not in doing so assumed an arrogant and better-knowing attitude. An excellent example of Li Wenzhong’s attitude was the victory memorial that Li had made up after he captured a 50,000 strong Mongolian army at Yingchang on 10 June 1370. 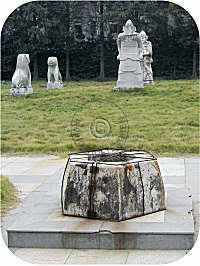 It was indeed a significant victory but the memorial was so arrogant that it made Emperor Zhu Yuanzhang furious. Zhu Yuanzhang tolerated the insolence a long way since Li Wenzhong was his nephew, but nevertheless got the last word in connection with Li Wenzhong's funeral, see below. And a King -Without a Horse? Li Wenzhong fell ill in the winter of 1383 and died under suspicious circumstances the following year in Nanjing, the (then) capital of the Ming dynasty. It is alleged that Zhu Yuanzhang personally ordered that Li be poisoned. The story goes that Li passed one last advice to the Emperor before he died, namely that the Emperor should kill fewer people and ensure to stop eunuchs' evil conduct. 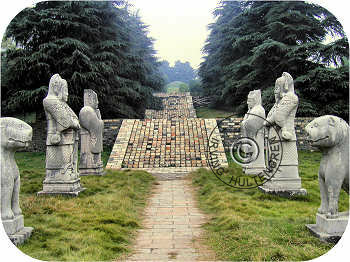 Emperor Zhu Yuanzhang posthumously bestowed him the title of King Qiyang. 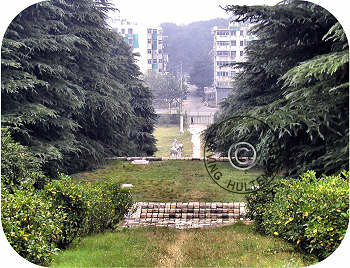 Construction of Li Wenzhong's mausoleum had started already in 1368, sixteen years before his death. 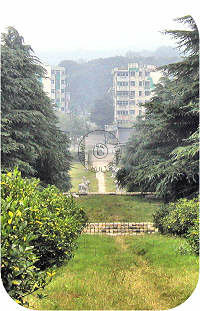 The Emperor had permitted that Li be interred on the northern slope of Zhongshan Mountain, the mountain also housing the Emperor’s own mausoleum. Enraged over Li Wenzhong's insolence, the Emperor ordered a hasty funeral with only the simplest of ceremonies. One of the stone figures, a horse with its handler, had not yet been completed. The Emperor got his final revenge by placing the half-finished sculpture in the tomb anyway, but not in its proper location lining the Sacred Way. 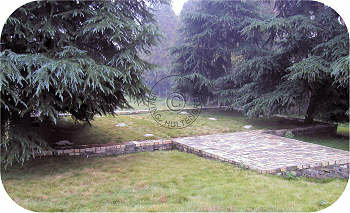 The tomb site follows the traditional mausoleum blueprint for a prince. It is long and relatively narrow. At the entrance but off the Sacred Way center line is a stele mounted in a tortoise. The stone tablet carries an inscription describing and praising Li Wenzhong's military merits. The Sacred Way first has a pair of columns followed by one horse with its handler. The western horse has not been put in its proper place across from its twin figure but is left discarded on the side in an unfinished state. After the horse follow pairs of sheep, tigers, civil officials and military officers. Off to the right of the Sacred Way is an old water well. This is from where the family would fetch water for the cooking of the sacrificial dishes used in the annual ceremonial visits to the tomb. 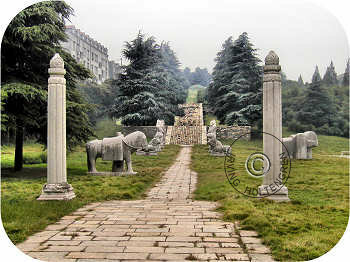 At the end of the Sacred Way are the remains of the sacrificial palace, Ling'endian. The palace had originally a front building and a main palace building behind it. Tablets, pictures and items used in the ceremonies were all kept in these buildings. The front palace building is 16.8 meters long and 12.1 meters deep. The main palace, which is located on its own platform elevated from the front building platform, measures 31.2 and 14.8 meters, length and depth respectively. 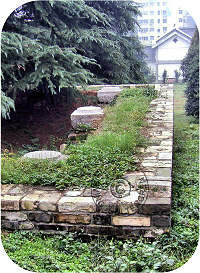 The platforms were made from stamped earth and retained with brick. The traditional quality control inscription can still be found burnt into many of the brick. The palaces deteriorated fairly early after construction. A recent restoration effort has left the stairways in a good condition and the platform walls have been totally rebuilt. The stone pillar bases have been put back to their original location. A tablet with the name of the tomb occupant has been erected some 50 meters after the main palace platform. 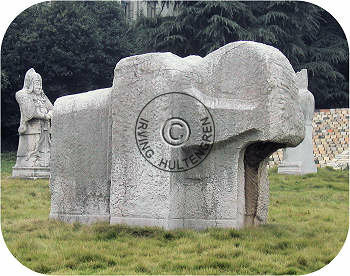 It is not placed in front of the tomb mound itself as one might have expected. 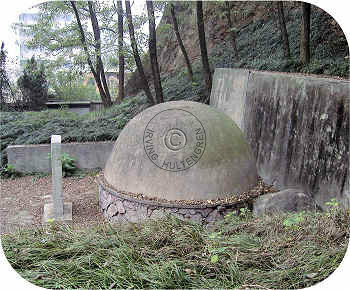 Several hundred meters further back and elevated further is the tomb mound itself under which Li Wenzhong rests. 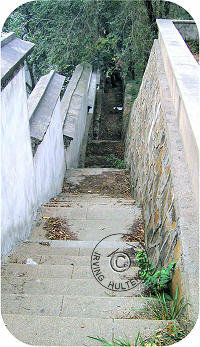 Narrow stone stairways run the total length of the tomb along both side walls. 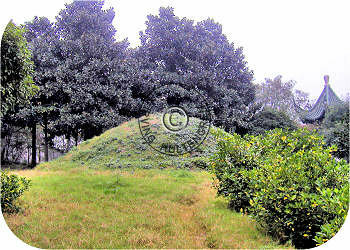 Interestingly, in more recent time the family of a "usurper" has cut into the tomb hill right behind and below the tomb mound and placed their relative's concrete tomb there! The mausoleum is generally well kept and lined with evergreen trees and bushes, rendering a proper quiet and harmonious impression.